Creating interactive artworks can always be a bit tricky. Will the audience know what to do? Will they interact with it? Will the piece withstand poking and prodding from the general public over the course of the exhibition? With so much to consider, interactivity is definitely a challenging task, one that Australian based media-artists Van Sowerwine and Isobel Knowles seem to have down to an art. Their latest interactive stop-motion artwork, You Were In My Dream is currently exhibiting at Experimenta’s Utopia Now, and an online version is available, so you can have a play with at home. Hello ladies. 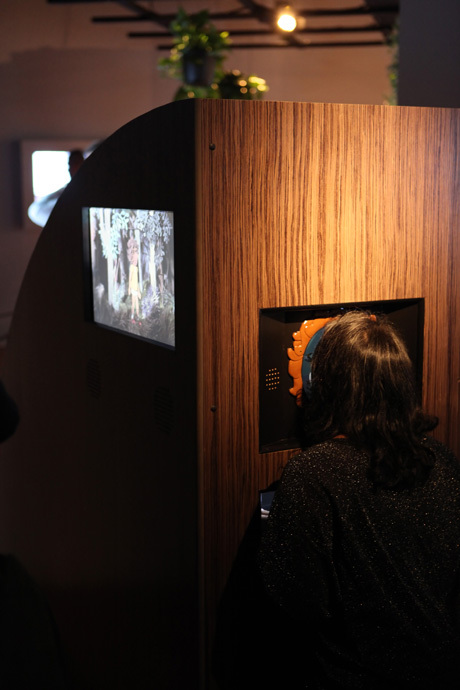 Could you please tell us a little bit about yourself and how you came to be exhibiting in Experimenta Utopia Now? We first worked together in 1999 — we both studied Media Arts at RMIT. Van was making an animation and Isobel volunteered to do cinematography. 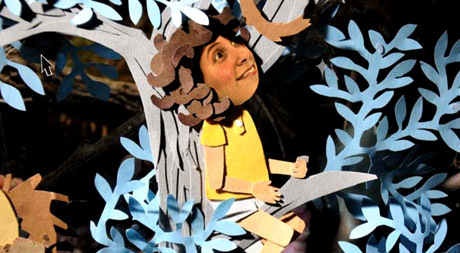 Since then we’ve made four animated films and three interactive installations together, all stop-motion. We hadn’t made anything together since the short film, Clara, in 2004 and we heard about the Experimenta commissions calling for entries. We’d been involved in other Experimenta shows and knew of what a great opportunity it could be to get our work out to a large audience, so we pitched for it and were successful. You Were In My Dream is your current piece, which is being exhibited in Utopia Now. What can people expect and what are the ideas and inspiration behind this piece? Firstly they can expect to have a lot of fun! The work has been up for a week and everyone seems to really enjoy using it. You need to interact with the work — you look into a wooden structure and see your face superimposed onto the main character’s face. 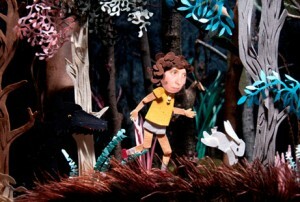 You then navigate your way through a magical forest where you transform into various animals. We wanted to make a work that looks beautiful and draws you into another world, but a world where you don’t always know what to expect. How did you interpret Experimenta’s brief for Utopia Now? We were aware of the fact that it’s so much easier to turn utopia upside-down and create distopic views of things and we were trying hard to find a way around being too cynical or making something gloomy. We were thinking about evolution and transformation and how wonderful it is that over time species adapt to their environments and develop different body parts to streamline them for whatever it is they do best. We came up with a character whose body and nature transforms to fulfil the requirements of the forest. Instead of trying to bend the forest to your will, you change to suit the forest. We wanted to use utopic imagery and paradise is often portrayed as beautiful untouched nature where the balance of life is in harmony. There was something about imagining yourself into children’s stories that played a part in the concept as well. 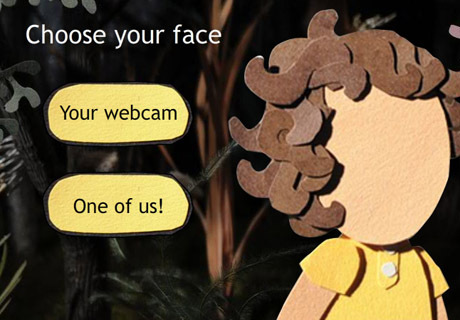 This is the motivation behind using an image of the viewer’s face as part of the animation. It will hopefully give you a strange out-of-body experience and make you feel like you’re in a dream. You have worked together on several pieces in the past. What are important elements in a successful collaboration? I think that essentially we’re really good friends and both of us keep ourselves very busy so the only time we get to hang out intensively is when we’re working together. So we do giant projects that mean we get to spend lots of time and we really get along so well that this makes for a very enjoyable work environment. We are both perfectionists and workaholics and I think for a collaboration to work both parties need to be prepared to take on the same amount of responsibility. Also we spend most of the time laughing which I think is important too! Your pieces often incorporate some sort of interactive element. Could you please tell me why this is and how have you overcome any technical issues regarding interactivity? We studied Media Art in the late 90s when interactive art was taking off — everyone was getting excited about making CD-ROMS and websites, and we became interested in trying to create different kinds of experiences for audiences. Interactive art has gotten a lot more sophisticated since then and it’s exciting to be part of what is still largely a very experimental field. Technical issues can be a little defeating – you just have to do so much testing to make sure the work is foolproof and that’s very hard to do when you’re trying to get a work ready to show. Also, whenever you’re inviting somebody to interact physically it’s so hard to predict how people will use it. I imagine that motion animation can be painstaking and tedious. How do you keep sane during long days and nights on set? It’s true that animation can be very slow, but you have to enjoy the process, which we both do. Even though it takes a while to shoot an entire scene, it only takes 30 minutes to shoot enough to get excited about making inanimate objects come to life. The thing that drives us most insane is that with this project in particular, most people will only see a small part of what we’ve shot and even then they’re probably focusing on their own face anyway! The general public are sometimes a bit wary and nervous of engaging/interacting with artworks. As media artists, how do you tackle this issue? In our experience the public have definitely become willing to interact with works over the years. We also try to make our work easy to use — in this work we use a mouse, which everyone is familiar with, and our structure makes it very clear what is expected of the public. What is probably more of an issue is making the work accessible while trying to encourage people to treat it with respect. It can be difficult to get across that an artwork is not as durable as an arcade machine. Do you have any advice for fellow media artists who wish to get their work out there and noticed? Get involved with as many people, organisations and galleries as you can and be prepared to work hard! We’ve both been involved in the Melbourne Fringe Festival and Next Wave festivals and found it a great way to get your work out there. What is next for Isobel and Van? A rest! You Were In My Dream took a year to make working very hard. We’d like to make another stop-motion film at some point but we’re not sure how or when. In the meantime we’ll we working on smaller projects separately.